I’ve been seeing a lot of art about family this year. Capcom’s Resident Evil 7 famously introduces gamers to the haunted Baker clan, while Fox’s X-Men movie, Logan tells a powerful story about building a mutant family unit out of broken parts. Whether or not this is a trend for 2017 is yet to be seen, but an upcoming indie game looks to join the family theme when developer Giant Sparrow releases their newest game, What Remains of Edith Finch later this year for Playstation 4 and PC. Focusing entirely on the mysterious and tragic story of the Finch family, I first heard about Edith Finch early last year when the game was showcased at E3 2016. I recently got my first real look at the game at a hands-on event last week when I got to play a chapter of a game that very much resembled an interactive novel. But just as the game’s literary influences run deep, I was surprised to find how ambitious Giant Sparrow’s follow-up to the minimalist Unfinished Swan really is. Taking on the role of the titular Edith, it’s the player’s job to explore the ancient home of the Finch’s and find out the tragic backstory of each of the Finch family members. Director Ian Dallas told me that each of the family members will receive their own little chapter in the collected Finch family short stories. For the demo, I explored the life (and death) of her cousin Lewis. Starting the demo as Edith, the player explores the room of Lewis Finch — rummaging through his belongings like boxes of video games and other personal items before coming across a letter from his therapist. What unfolds is the story of Lewis’s final moments as recounted by his therapist and as explored by an ingenious gameplay hook where players take control of Lewis at his job at a local fish cannery. Weaving together the narration provided by Lewis’s therapist and slowly evolving gameplay unique to Lewis’s portion of the game, it’s probably most accurate to say that I was left breathless by the end. Utilizing expert storytelling and asymmetrical gameplay, the Lewis chapter of the demo built up a little, self-contained epic revealing what felt like Lewis’s entire life through a short half hour demo — although I had a hard time keeping track of time due to how engrossed I was. 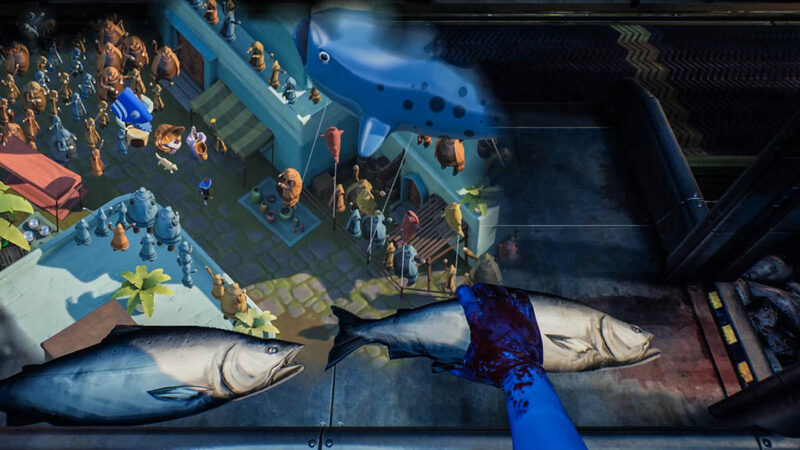 Starting from the monotony of decapitating fish heads at the cannery, to a story about Lewis’s struggle with his mental health, Edith Finch beautifully navigates the player through a series of escalating set pieces before finally revealing the final fate of Lewis Finch. The gameplay, which evolves with the story, begins with the player physically moving fish from one side of the screen to the other. Eventually however, the game begins morphing into a little fantasy RPG, while also forcing players to remember that ultimately, they’re still just chopping off the heads of dead fish. Dallas explains that each Finch family chapter will have its own unique gameplay hook, and if they’re as ingenious as the Lewis chapter, I can’t wait to dive into the whole Finch family tree. While not a horror game per se, What Remains of Edith Finch is a title that straddles the sublime and the disturbing through the lens of a single family that might as well be haunted. Fear, as we all know, doesn’t necessarily need to be in the form of zombies and ghosts to reach down into our cores and shift the unpleasantness in us. Be sure to check back Wednesday when we publish an interview with the developers of What Remains of Edith Finch, or check out the game when it launches on PS4 and PC April 25, 2017.